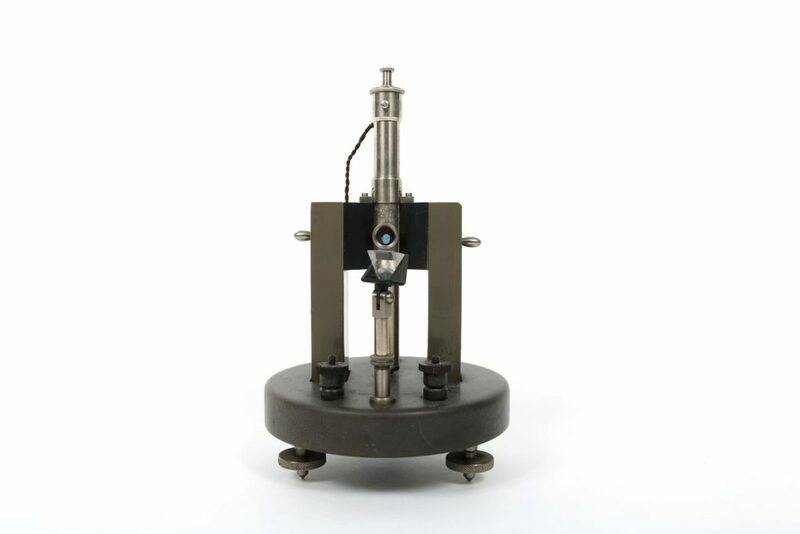 This object is a mirror galvanometer. It consists of a thick circular insulating base with adjustable tripod legs. At the front of the base there are two electrical contacts with screw plastic knobs to enable wires to be securely attached. Between these two there is a cylindrical metal stand with a small prism mounted on a hinged plastic support. Behind this, a horseshoe magnet is mounted vertically, with the open ends pointed upwards. 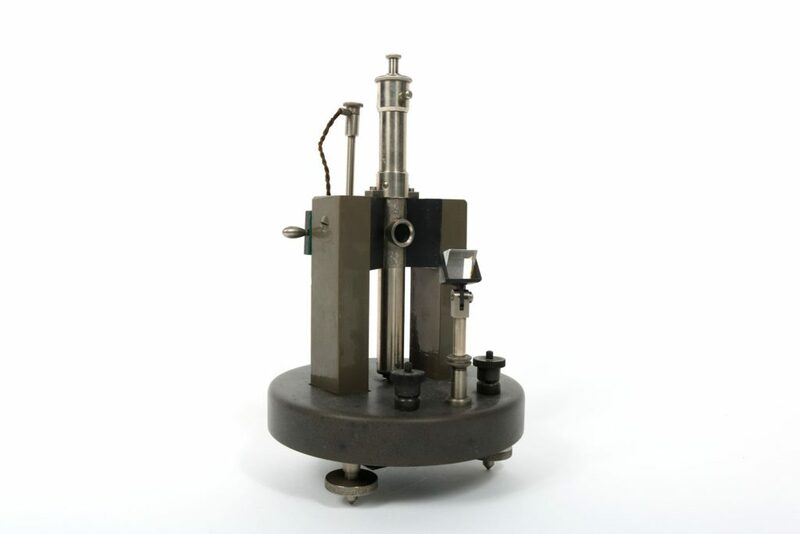 Between the two ends the cylindrical metal suspension tube of the galvanometer is mounted vertically, supported between the magnet ends with plastic pieces and attached with screws. In the front of the tube there is a small round window. Behind the window a round mirror is visible. 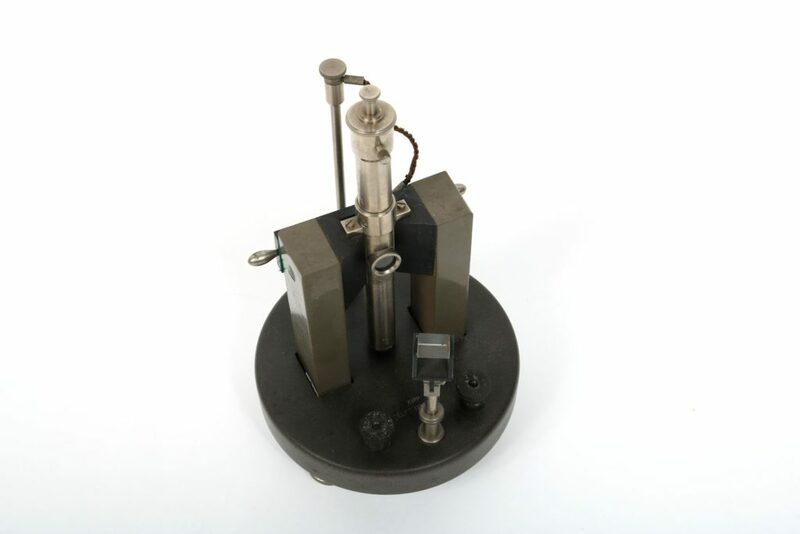 Magnetically attached and adjoining the two ends of the galvanometer there is a flat metal rectangle with metallic handles on each end. This piece has green felt on the inside surface. Behind the suspension tube, there is a tall thin cylindrical stand. At the top of this, a pair of twisted fabric-covered wires emerged. This wire hangs loose. 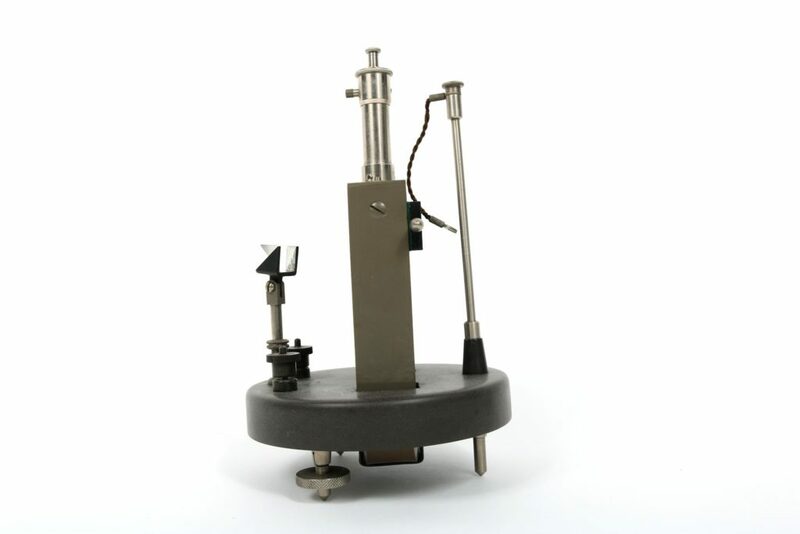 A mirror galvanometer is for the measurement of very small changes in current. Light is reflected on the small mirror in the interior. This mirror is connected to a fine wire which is affected by tiny shifts in electrical current. The amount of the deflection of the mirror can be used to measure electrical current. Very Good: The galvanometer shows few signs of use. There is a white crystalline residue on the two knobs of the electrical contacts. The wire that connected from the tall pillar behind the suspension tube to the top of the suspension tube has been disconnected and the fabric insulation is slightly fraying.